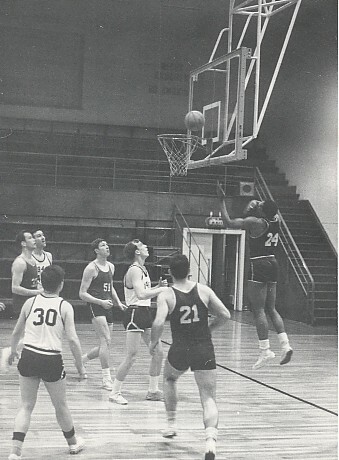 against Hospital Company in 1966. These first three photos were provided by Tom Rogers. 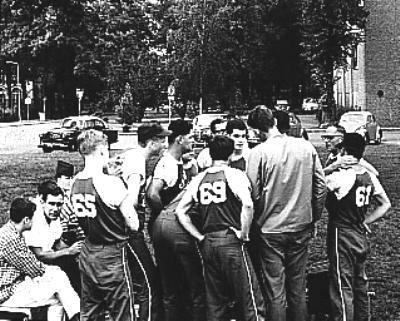 Tom Rogers in middle, behind number 69, giving pre-game instructions. Some of the guys in photo are First SGT Bowser, RD Anderson, the late Freddy Tulbert and FSBVG's Joe Goff. Tom Rogers, Tim Russell, Randy Chapin, SP4 Patterson (company clerk), Ralph Vitale, Frank Tiriolo, SGT Ted Pratt. In front: Captain Frank Rownan (now known thanks to Fred Gesin, note below) and Bobby Gilbert accepting trophy and COL John Smith. Here's a note to clear up the mystery of the "unknown captain" [formerly] noted in the caption above. From: Fred Gesin, who wrote this when he signed up for our FSBVG website update mail list. Comments: Was looking at the sports pictures. 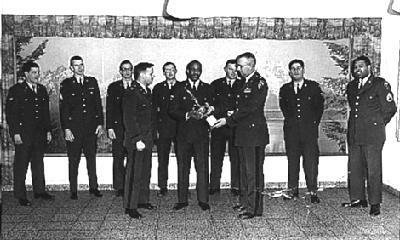 Regarding the one with Colonel Smith presenting the tropy to an "unknown CPT" : The CPT was Frank Rownan, CO of Co B.
I was CO of Co A in 1966-67. He was assigned to FSB in 1965. 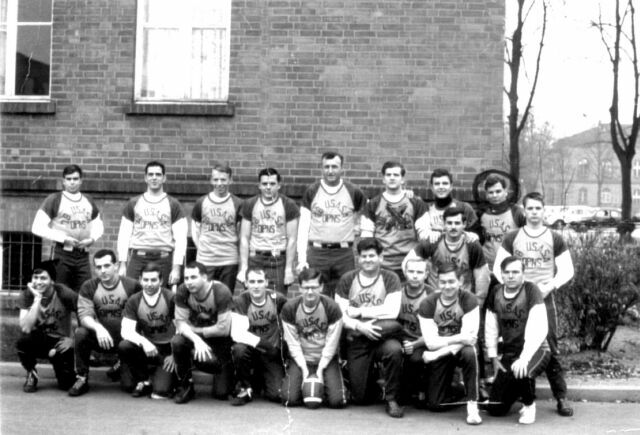 This is a team photo of the 78th ASA (forerunner of the 54th and FSB) flag football team from 1966. We finished second in the Berlin Brigade, losing narrowly to the Signal Corps in a rather brutal game. I remember seeing a photographer prowling the sidelines. It turns out his name was George Gongora, and we would work together at the Corpus Christi Caller-Times Newspaper in the late '70s and early '80s. Lot nicer guy in Corpus Christi than he was in Berlin. At that time, the 78th had two companies, Operations Company, which was the linguists, and diddy-boppers, and Headquarters Company, the cooks, administrative personnel, etc. We didn't split into Companies A and B until the 54th was designated in 1967. The 78th Opns. 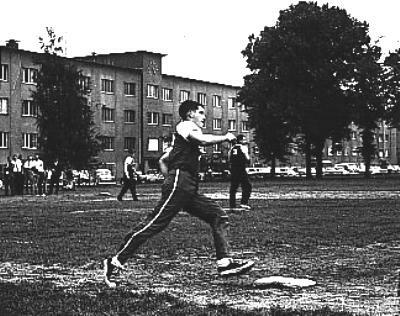 Co. won the Eastern League title but was defeated in the Berlin Brigade title game for the Commanders Trophy by the Signal Corps. The team members from left, front, are Larry Gross, Walt Baer, Lenny Russell, Chuck Ritchie, Rick Baur, Clarence Pinkerton, Frank Denton, Ron Dyer, Joe Huhn and Fred Murphy; and from left, rear, Paul Grull, Bob Dunlap, John Darby, Kenny Miller, Tiny Klosterman, Dave Watson, Ozzie Ozsimkowski, Steve Sanders, Don Cooper and Butch Day. Here's a photo of the team from my Company A that won the 1969 Chief's basketball Tournament runner-up trophy from COL William Hamilton, CO FSB. We lost to Herzo that year in a heart breaker, but I managed to get the game ball and kept it for many years after that.